In February 2008, PayPal released a list of recommended browsers for interaction with their e-commerce sites. (Source: Michael Barrett, PayPal’s Chief Information Security Officer). PayPal notes lack of Safari support for a “builit-in” anti-phishing filter and lack of support for Extended Validation (EV) Certificates. These anti-phishing mechanisms are supported in browsers such as Microsoft's IE7 and IE8 and FireFox 2.0 and 3.0. The Extended Validation (EV) certificate mechanism is a web browser technology that turns the address bar green when the browser is legitimate Web Site. It is important to note that both of these browser-based functionalities are designed to further educate and inform the user of a possible malicious hacker site “posing” as the legitimate SSL protected "target" site. PayPal accurately states that the Safari browser does not include these features. MultiFactor’s SecureAuth™ product, a webserver based software product that can be installed and utilized by e-commerce sites on their webservers, is designed to AUTOMATE this inspection. In fact in an authentication validated by SecureAuth™, the issue of education and improper usage is removed from the user via an automated process. SecureAuth™ by MultiFactor, includes a browser extension for Safari that automates the inspection of the endpoint. 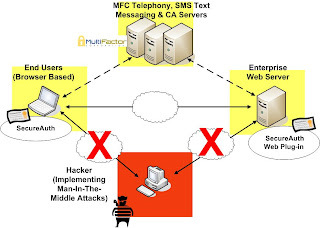 A bi-lateral key exchange is conducted by SecureAuth, between the legitimate web server and the end user. If a hacker site attempts to “phish” the user via a man-in-the-middle attack or some other replay mechanism – the authentication is automatically flagged by SecureAuth™ and the session is dropped. (See Diagram #1) Diagram #1 – SecureAuth™ Server and Web Components identify and automatically mitigate Man-In-the-Middle and other Identity theft attacks. It is important to note that the SecureAuth™ plug-in, available to Safari users, provides a more secure internet e-commerce authentication than other browsers – regardless of their support of the “Anti-Phishing” bar or EV certificates. SecureAuth™ conducts the e-commerce authentication automatically and validates the bi-lateral session – without user knowledge or training. SecureAuth™ also supports IE and FireFox browsers – thus users on all platforms can achieve this level of site validation – if the enterprise is wise enough to deploy MultiFactor SecureAuth™ for authentication. It is important to note studies have shown that most browser “user education” mechanisms provide little to no value in the fight against on-line fraud. A study conducted by Stanford University and Microsoft revealed users, even after browser education, were still likely to judge all sites legitimate – regardless of whether the sites were fraudulent. Garret Grajek is the president and founder of MultiFactor Corporation. He is a certified security engineer who has deployed 100s of security solutions while working for RSA, IBM, Cisco and others.